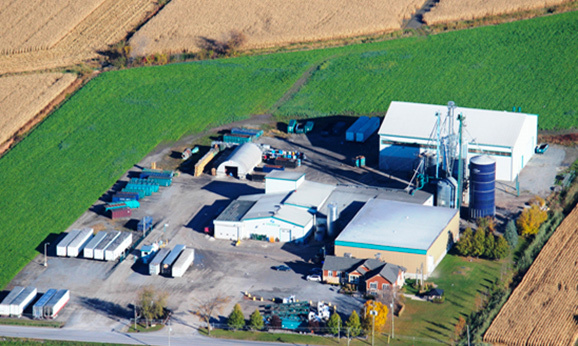 Headquartered in Saint-Hyacinthe, PROREC specializes in food recovery and the manufacture of animal feed byproducts. Founded in 1996 by brothers Martin and Stéphane LeMoine, while they were looking for ways to reduce their hog farms’ production costs without compromising their environmental values, the company has since been growing steadily serving the food industry, millers and farmers. Leader in the East of Canada, PROREC valorizes by-products from the food industry and offers a responsible and cost-effective way to manage your output gap. PROREC also supplies by-products intended for animal feed. These products are nutritious, reliable, consistent and economical while contributing to reduce the cost of your rations at equal performance. Whether you operate in the porcine, bovine, dairy or poultry sector, PROREC is your alternative for economical animal nutrition and is also the smart environmental choice for your food recovery! Did you know PROREC is a CFIA-CERTIFIED, CARBON OFFSETTING company, also LICENSED TO ISSUE CERTIFICATES OF DESTRUCTION and the holder of a MDDELCC permit from the Quebec Environment Department?